Following several short-term trips, Becky and Tom Brockelman, cross-cultural workers from First Baptist McKinney, Texas, arrived in Sierra Leone on November 10, 2010, to live full-time. They were looking forward to answering God’s call on their lives to be the hands and feet of Christ in Freetown. They had only been there a few weeks when one of the Bible College interns they were working with told them about a young street boy in Waterloo who was suffering from a chronic skin disease. The interns thought that the Brockelmans could help. And, on January 15, 2011, Tom met that 10-year-old boy named Bo. The Brockelmans actually ended up helping three other boys in addition to Bo, getting them into a clinic for treatment. The other three recovered from their various ailments and were released, but Bo’s skin condition had not improved. The Brockelmans proceeded to get a one-year guardianship for Bo so that they could seek additional treatment for him. In December 2011, they brought him to Children’s Medical Center in Texas where doctors were finally able to prescribe a treatment to offer Bo relief. As Bo had captured their hearts, they then extended their one-year guardianship into a guardianship until he was age 18. In 2014, they decided to pursue adoption. Then came Ebola, and all the justices were leaving the country. Plans for adoption were temporarily put on hold. The adoption was ultimately finalized in 2015, and Bo officially became a part of the Brockelman family. In January 2016, they learned about an option for Bo to get his U.S. citizenship. The Brockelmans began that process on March 1. Four months later, they got word that they had 12 days to tie up any loose ends in Sierra Leone and book travel to the U.S. for Bo to be sworn in. 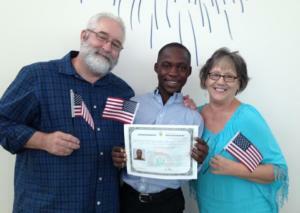 There was a flurry of activity, but Bo Brockelman was sworn in at a private ceremony as a U.S. citizen on July 20. All three Brockelmans will soon be heading back to Sierra Leone. We know they are looking forward to seeing what God has in store for them next!